oral arrangements to marijuana favors for guests, there are many ways to incorporate marijuana into the more classical wedding traditions. The Guardian reports on one wedding that featured a “pot sommelier”. Wearing a three-piece suit, the elegant professional presided over a “dab bar”, and gave guests guidance on the best marijuana pairings for their palettes. The Atlantic describes another couple who chose to share a “first toke” with their guests in lieu of a more traditional first toast to the newlyweds. Still other couples commissioned specialty versions of traditional wedding products, such as a four-foot ice bong, or a “unity bowl” with two mouthpieces, upon which the couple could share a ceremonial first toke together. For wedding planners, caterers, florists, venue operators, and other wedding vendors, the legalization of recreational marijuana in California has created a vastly-expanded potential market of specialty services to offer their clientele. While the marijuana industry is still highly regulated, it is also very profitable. 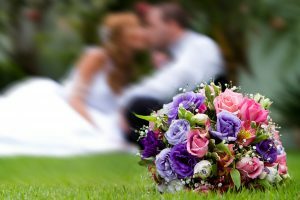 Wedding vendors can successfully execute business expansions with strategic operations, legal compliance, and other important business planning. Venues can face potential liability for serving cannabis on the premises, but this can be mitigated with effective planning and compliance. Cannabis is somewhat analogous to alcohol in this regard: while venues can be liable for over-serving guests, or serving underage guests, a venue can protect itself with strict rules and training for its staff. Local permits may also be required, depending upon the city and county which govern the venue. For couples and coordinators planning events: be sure that your venue knows you plan to serve cannabis at the event. Consider making this a preliminary question when touring venues and making initial decisions. A venue may be able to cancel a contract at the last minute if it does not allow cannabis on its premises. Safe transportation of all guests should be a top priority for the couple, the planner, the venue, the catering staff, and anyone else involved in the planning of a cannabis wedding. This is not only out of a moral obligation to ensure the safety of imbibers. Any and all parties responsible for providing cannabis could face legal liability for any accidents which result from marijuana served at a wedding. To this end: ensure that the event has designated drivers and access to public transportation. Check the availability of ridesharing services (such as Uber or Lyft) before the event. Have many different options available so that no one’s safety is left to chance. Many marijuana advocates want to make cannabis part of their special day. Wedding planners and vendors can ensure their legal compliance – and avoid the potential for criminal charges – by consulting the best marijuana business lawyer. He or she will help you plan to expand your business into this highly-regulated and profitable market.